We all know the scenario: First, we give instructions. Then we move around the room offering encouragement as students diligently engage in meaningful instructional activities. At least that is what’s supposed to happen. The reality can be quite different. Even the most meticulously planned lesson can fail without a system in place for students to get help when they are confused about their work. Frustrated students can act out in various disruptive ways and become so discouraged that they stop working. From students with learning disabilities to those who lack self-confidence, many students have trouble getting the help they need as they work through an assignment. 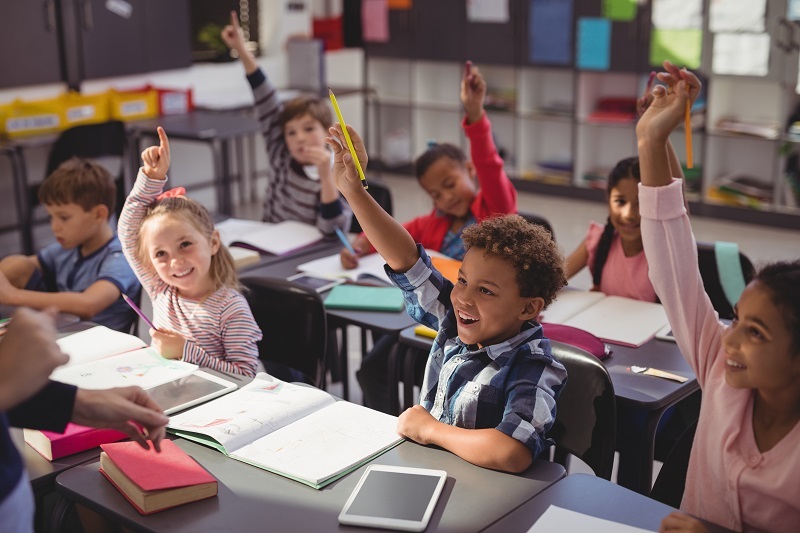 To build academic resilience and to create a supportive class atmosphere that encourages learning and independent thinking, it’s important to establish procedures that allow students to ask for assistance without disturbing others. Encouraging self-reflection about their work is an added benefit of having a system in place as students learn not just how to ask for help, but also the difference between asking for clarification of the instructions and asking for additional information or more specific help. One easy strategy that many teachers use to prevent students from becoming disorderly when they are confused and frustrated is to review problem-solving skills and productive work techniques at the start of a new lesson. Knowing how and when to use the specific skills required to complete an assignment successfully makes it easier for students to build their confidence and resilience. Another solution that enables students to get aid when they need it is to put them in groups or pairs to work. This can be particularly effective when the group or pair has at least one member who is knowledgeable about the material and so can act as an expert. Together, these students can work through problems when they are still small as well as build each other’s confidence. Allowing students in a whole group setting to talk together quietly and to share information and strategies can also be effective when the parameters for working together are clear. It is best to go over your expectations for this type of large-scale sharing before beginning and to limit the amount of time for it to keep students on task. Because it is important to keep students engaged in learning for as long as possible, it is helpful to provide alternative activities for them to do if they have to wait for you to make your way to them. You can do this by listing alternate activities on the board, providing learning centers, or by providing a folder of individualized remediation or enrichment activities for students to complete. Place a Velcro strip on the front of each desk and give each student three laminated cards with similar Velcro strips on the back of each. On the front of one card, write “I’ve got this.” On the second card, write “I am struggling” and “I am stuck” on the third. If you have students who do not read or write independently, instead of written messages, use emojis. Instead of using cards with text, many teachers find that red, yellow and green cards are also effective in indicating levels of confusion or confidence. Have students attach the most suitable card to the strip on the desk either when you ask for a quick evaluation or whenever they need help. Still other teachers have found colored cups to be a quick way for students to indicate their need for help. A red cup would indicate that a student is stuck while a yellow one means that some help would be appreciated and a green one shows that the student is comfortable working independently. Students can place all three in one stack with the color they would like you to notice on top. You can also periodically check for understanding by asking students to give you either a thumbs-up or a thumbs-down hand signal. You could also have students rate their knowledge with a show of fingers with five fingers indicating a complete understanding all the way down to one finger indicating a need for help. Some teachers have found that a simple tent made of note cards taped into a triangle shape works well for their students. The cards can either have the same text on each as the laminated cards mentioned above or be color coded. You could also mark off three columns on your board headed Help, Struggling and Got It. Pass out sticky notes, and have students write their names on them. Periodically, have students rate their work by placing a sticky note in the appropriate column. This strategy also provides an opportunity for student movement and conversation. Another strategy that many teachers have found successful is to have students who need help write their questions in a designated area on the board. This is effective because it forces students to articulate their problems, allows others to see if they are experiencing similar difficulties, and makes it possible for you to discover any patterns in the confusion your students may be experiencing.